Advice, help and guidance for radio station operators. Informal and formal training, licence applications and interim management. Audience research design and analysis. Studio design and project management. Transmission system planning. Brian Lister has been described as one of the UK's most trusted and respected radio consultants and trainers, working with numerous radio groups of all sizes he has also aided numerous groups to gain commercial and community radio licences. With his uniquely diverse, multi-skilled operational background in BBC, commercial and community radio, Brian has recently specialised in station launches, programming consultancy, interim management, training and radio licence application projects. Brian's passion for radio is life-long; initially involved in radio through setting-up a hospital radio service in Romford, he became manager of University Radio Essex while studying for his BA (Hons) in Telecommunications, launching the station in 1971, then trained with BBC Radio as a Studio Manager, working at Broadcasting House and with the Overseas Services at Bush House. In 1974, he joined Metro Radio for the launch of the Newcastle radio station. It was there that he developed his programming skills, starting as Technical Operations manager and becoming the Assistant Programme Controller. With the acquisition of Radio Tees by Metro in 1986, Brian was appointed Programme Director and General Manager of the Stockton-on-Tees company, very successfully re-launching the station as TFM Radio. From 1985 until 1995 he was also a director of Sunderland Community Radio Association Ltd., who operated the Sunderland local radio licence as Wear FM. Brian was part of the A1FM consortium that won the Darlington licence in 1995, but he departed to become Managing Director of Stray FM in Harrogate, where he successfully took the station to market leadership and steered the business into profitability. In 1997, he left to re-join A1FM, which had struggled to launch successfully. He re-launched the station as Alpha 103.2 and delivered top audience figures and commercial success. In January 1999 he was appointed Managing Director of Sun FM in Sunderland. After the station was taken over by Radio Investments Ltd (RIL), Brian was appointed Group Development Director for the group that was to become The Local Radio Company. Brian co-ordinated and wrote many winning Ofcom licence applications for the group and he continues to assist TLRC in his role as a consultant. Brian also works with various other radio businesses and projects, providing training, interim management and assisting them with his considerable experience in radio programming, development and operational organisation. In 2007 Brian worked with United Radio on an application to the BCI for a new licence in the north-east of Ireland and with GMG on an application for the Aberdeen licence. Recent work includes studio design and relocation for Jazz FM and management consultancy for Lyca Media. He was a founder director of the Radio Teesdale community radio group and has been a trustee of the Public Service Broadcasting Trust. Brian is a former board member of the Commercial Radio Companies Association, and in the 1970's served on the National Executive of the broadcasting union ABS, now part of BECTU. In 1998 he was called to give evidence to the House of Commons Select Committee on Culture, Media and Sport on the future of local radio and digital broadcasting. With an enviable history of numerous winning licence applications to his name, Brian boasts a proven track record of success as a manager, consistently delivering profitability and audience improvements at those stations under his stewardship. He is a visiting lecturer in radio production and management at the University of Sunderland, and is currently chairman of the North East branch of the Radio Academy. Managing Radio was the first detailed and comprehensive practical guide to all the essential elements of managing radio stations. It covers the management of public service, commercial and community radio stations and the wide range of new DAB, online, web and independent production opportunities. The publication came out of a collaborative project between the authors, Brian Lister, Caroline Mitchell and Dr. Anthony O'Shea, who worked together on radio management courses for the University of Sunderland's successful MA in Radio (Production and Management). 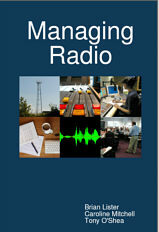 A useful text for students studying the theory and practice of managing radio, it is also an authoritative guide to setting up a station or radio service from scratch. It explores how to create sustainable radio through managing for profit, public service or the participation of the audience in all parts of the station. Managing Radio provides useful practical advice, examples of contemporary radio management practices and case studies of management in action, backed up with references to wider academic reading in media, business and cultural studies. A paperback edition of the book can be purchased HERE. Managing Radio is published in association with the University of Sunderland Department of Media by Sound Concepts and edited by Brian Lister. First published on-line July 2009.